Internationally renowned optical art museum from Korea. Six different themed zones to immerse yourself in. First ever 3D + Augmented Reality Museum. State-of-the-art AR technology makes exhibits come to life. Present your iVenture card at the Trick Eye Museum ticketing counter to redeem your entrance tickets. Last admission for the museum is 8 pm and it’s a good idea to leave at least two hours to see and experience the whole thing. Don’t forget to bring a fully charged camera! Collection Information Present your iVenture card at the Trick Eye Museum ticketing counter to redeem your entrance tickets. 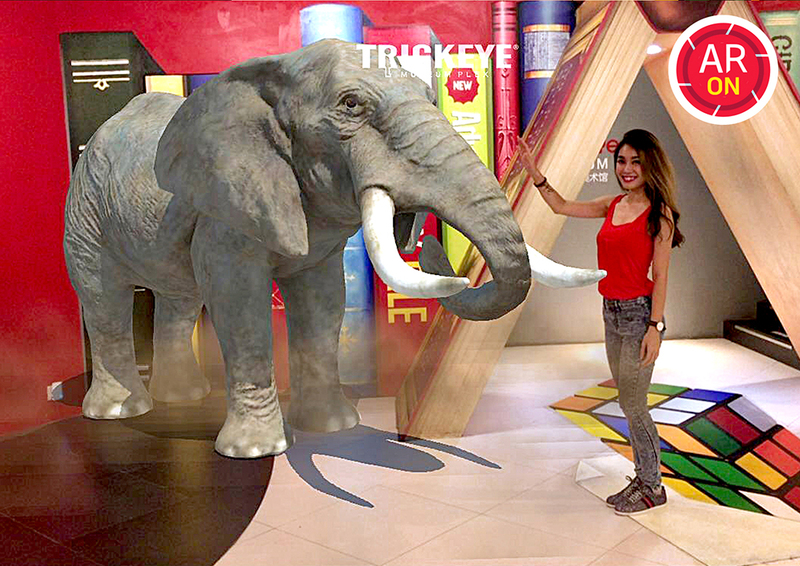 Get ready to let your imagination run wild in Trick Eye Museum Singapore, an internationally renowned 3D art museum from Korea. With its huge array of art exhibits hand-painted by dedicated Korean artists, each exhibit comes to life with the use of a special art technique (Trompe-l’oeil) that makes 2D art pop up into 3D. Feel, touch and interact with the exhibits in 6 different zones, and enjoy a day filled with fun, laughter, adventure and excitement. NEW! 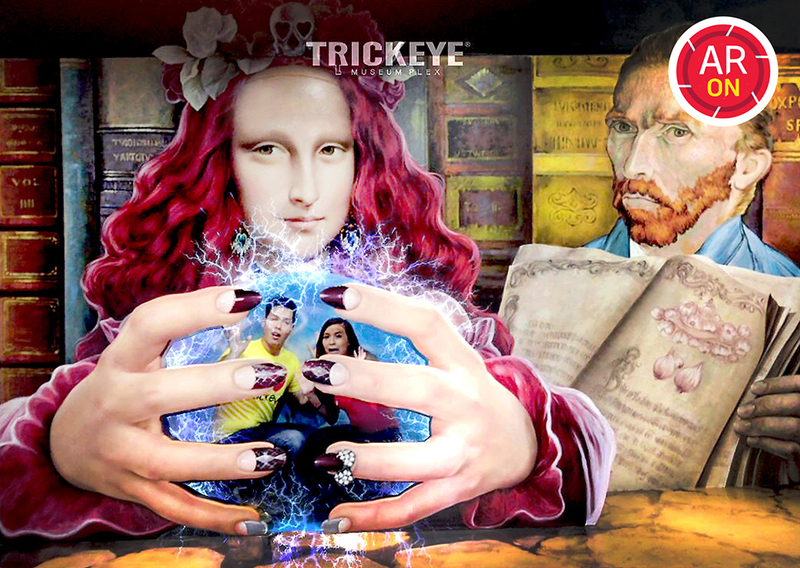 With Trick Eye Museum’s very own Augmented Reality mobile app, you will see a whole new world of AR appear before your very eyes. Discover a hidden world of that is seen only through the app. 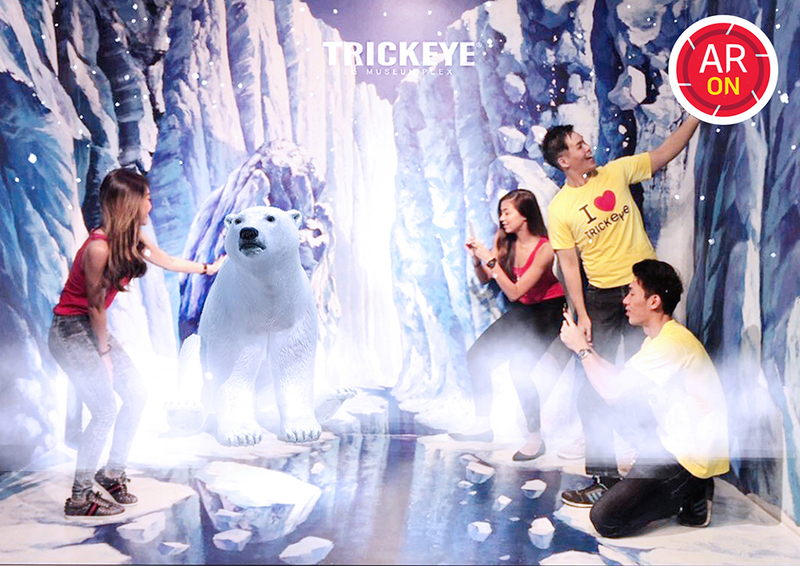 Simply download the free “Trickeye-Singapore” mobile app from Google Play or App Store, and watch as your photos and videos come alive with hidden animals, magic, fireworks and other special effects! It is advisable to download the Trick Eye mobile app as it’ll allow you to capture all these wonderful moments and share them with your friends. The app itself comes with a lot of add-on photo and video features that will really bring your photos to life. If you’ve got one, it’s advisable to take your selfie stick as some of the exhibits can become crowded so this is the best way to get a picture easily. That said, the Trick Eye is best experienced in a small crowd so there’s always someone spare to take your photo.